A nameless cryptocurrency fanatic capitalized on this week’s dramatic bitcoin price plunge by diligently scooping up ​​​​$400 million worth of bitcoin. Cryptocurrencies have had a tumultuous start to 2018. At the beginning of the brand new shiny year, many Crypto currencies had been riding a wave of exponential growth, and the market capitalization of the crypto currency space grew to the point that a $1 trillion valuation didn’t appear unreasonable. Then, early in the New Year, lack of confidence collapsed the market, and the top 1000 cryptocurrencies slumped significantly, causing a global crypto currency depression. At the same time as the price crash won’t have been the cryptocurrency bubble pop that many analysts have anticipated, it did imply that top cryptocurrencies, even industry leader bitcoin, fell to their lowest levels in months. Although bitcoin dipped south of $6,000 per coin in early February, according to marketplace Watch, the rate has consolidated and risen substantially. In fact, it has climbed gradually each day and has climbed more than 60% in the past two weeks or so, eventually clambering up to and above $10,000. 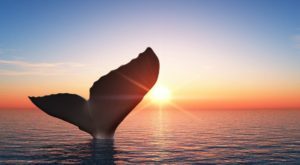 Questions are now been asked, who is The Bitcoin Whale? Reputedly, the nameless cryptocurrency trader who made a prime investment inside the high risk Cryptoverse imagined that this upward trend will continue. Nonetheless, bitcoin’s spot price remains some distance beneath its all-time high of shy of $20,000 per coin, attained in December in 2017.
Who made the astonishing ballsy purchase? As of now, his or her identification has been tough to nail down, almost impossible if they choose to remain anonymous. Alex Sunnarborg (Tetras Capital founder) commented “not sure who that large purchaser was, however many have sold this dip and bought the rebound after regulatory clarity within the U.S. and Asia”. The acquisition was made between February 9 and February 12 to an account related to the bitcoin address 3Cbq7aT1tY8kMxWLbitaG7yT6bPbKChq64. That account has seen its bitcoin balance balloon from 55k BTC rocketing north to almost 96k BTC. Whoever you are thanks for showing us all how to trade like a Boss!